This special show happened during MBS' 'Music Week', which held in October 2014. In this programme, four members of Morning Musume。´14 talk about their music history. Our hosts for this programme are Morning Musume。 9ki Fukumura Mizuki and Sayashi Riho, and 10ki Iikubo Haruna and Ishida Ayumi. If you missed it, here's the first part. Or perhaps you might want to skip to the third part? With Morning Musume。 celebrating its 17th anniversary, in this second part, the girls look back on Morning Musume。's history, albeit from from when they joined. 2nd January 2011. The 9ki were announced at the Winter Hello! Con in Nakano Sunplaza. Fuku-chan's passing came as a surprise even to the other three 9ki, who had thought that they were the only successful candidates. So when Fuku-chan came out, Riho was like 'Who's this? Who's this?' Tsunku♂-san was the only one who knew about it, so there was a flurry of activity even amongst the cameramen, who had to quickly try to figure out where Fuku-chan was. Ishida remembers watching videos of the announcement, seeing Fuku-chan's name being announced, the look of surprise she had in the bleachers, and coming down the stairs. 'How childish...' Ishida thought, despite being a kid herself. After all, the 9ki seemed so tiny in the midst of the mostly grown-up members of Morning Musume。at the time. In April 2011, Sayashi-san entered middle school. She'd moved to Tokyo and didn't have friends when she transferred in the middle of her primary 6th. So she was thankful that she was able to start from zero by entering middle school. Everyone knew that she was in Morning Musume。, and was kind to her, so she's thankful for those three years. And on the 6th, their 45th single Maji Desuka Ska was released. As the 9th gen's first single, Fuku-chan mainly remembers the huge 'Ma Ji De Su Ka Su Ka' that was at the set for the music video. She had thought that it would have been CG-rendered, but no, it was a physical object. Riho remembers the camera-on-rails, and the feeling 'This is the world of entertainment!' welled up in her as the shooting went underway. It was emotionally moving. June 15th. 46th single Only You was released. Sayashi-san played main vocals for this one, which she remembers for how high-pitched their voices were back then. September 14th. 47th single Kono Chikyuu no Heiwa wo Honki de Negatterun da yo! went on sale. This was Takahashi Ai's last single. Trivia thanks to Riho: Takahashi-san's birthday is also Morning Musume。's birthday. While Haruna remembers the single being dazzling, Riho remembers it for the high-exposure outfits they had on. Fuku-chan was impressed with their senpai at the time, who were dancing in high heels, while the 9ki were still performing in flats at the time. The 10ki members joined in September 2011. On the 29th, it was announced that four members would be joining the Musume。 as their 10ki at the Nippon Budokan performance of Morning Musume。's 2011 Autumn tour. At the time, Ayumi was nervous, worried that she'd flub her introduction, but looking back at it, it was quite the luxury for their first stage appearance to be at the Nippon Budokan. Harunan agrees that they were really lucky, showered with such extravagances. Because of that, she's thankful to the senpai, because it was due to their hard work that the 10ki were able to join in at the Budokan stage. For the 9ki, it was somewhat unbelievable that they'd end up with kouhai in the year that they themselves joined. They'd just gotten over starting out on tours when the new members were announced - at the time, Mizuki was still green enough that she was still getting told off by the teachers. In fact, Riho remembers the 9ki getting told off in front of the 10ki when the 10ki came to watch the rehearsals on the next day. The 10ki representatives don't remember it at all though, perhaps because they were too nervous. Mizuki: I felt like it was inexcusable. The memory that remains in Iikubo's mind was Takahashi-san's solo song, she only remembers bits and pieces besides that. The 30th of September was Takahashi Ai's graduation, and Niigaki Risa took up the mantle as the 7th leader. The 10ki hadn't had much in terms of activities with Takahashi-san, which made Harunan envious of the 9ki, seeing them give heartfelt messages to Takahashi. All the 10ki could do was congratulate her on her graduation - except Maachan, who cried. Riho thought that Maachan really liked Takahashi-san, but alas, Iikubo reveals that she just got caught up in the graduation atmosphere. 25th January 2012. Release of 48th single 'Pyoko Pyoko Ultra'. 10ki's first single. As their first single, the 10ki were brimming with excitement and anticipation, wondering what sort of song they'd get. When they heard the title however, they got confused. 'What the heck is that supposed to be!?' The title was made up of words they'd never heard before, something unique by Tsunku♂-san. But it hit them when they found out that they'd be dressed as chicks. In April, Fukumura and Ishida enter senior high. There had even been an event to commemorate it. Ishida herself doesn't feel like anything about her changed when she entered senior high. But because she and Fuku-chan were the same age, they hung out a lot and became good friends, often doing things like going to watch movies together. The 10ki are really grateful for the presence of the 9ki, as they're close in age, so they can talk about anything. They didn't need to humble themselves before the 9ki, they could be more straightforward. To the 10ki, it felt like an indulgence. 11th April. 49th single 'Renai Hunter' was released. This was when the melody started changing, towards more dancing-focused EDM. This was also the final single for Niigaki Risa and Mistui Aika, who graduated at the Budokan on the 18th of May. Michishige Sayumi-san was then tasked with the post of 8th leader. 4th July. 50th single, double A side 'One Two Three / The Matenrou Show' was released. This single also made history, marking their 50th single in a row to make the top 10 of the Oricon charts. Even now, just the intro of One Two Three at concerts starts pumping up the audience, which always feels great. It's a song that's loved by the members and the fans alike. Harunan feels that it was a stylish song to suit their new, stylish leader Michishige-san. Riho remembers that the change of song style became a topic of discussion among the members. The outfits were cute as well, decked in their member colours, which made it easy to know who was who. 14th September. Announcement that Oda Sakura would be joining as an 11ki member. Just like with the 9ki, not even a year had passed before the 10ki got new juniors. It was a bit of a surprise that only one person made it, given that both the 9ki and 10ki had four members each. 10th October. 51st single 'Wakuteka Take A Chance' went on sale. It was with this song that the formation dances started full blast, where you'd see them doing things like form an 'M' that's only visible from a birds-eye view. Since they couldn't get used to it, they used to practise until late at night. However, thanks to those efforts, they can now perform this song nicely even without practice. 18th November. Tanaka Reina announced her graduation. The girls did worry about what the fans would think on the day of the announcement. But since Tanaka-san said that she'd graduate cheerfully with a blast, the girls didn't cry either, but instead aimed to do their best until her graduation. 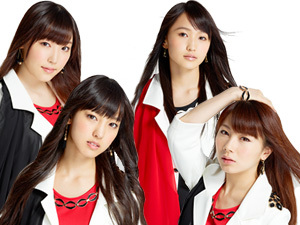 We now go into 2013, the year where they made their return to the long-missed Oricon Weekly 1st. 23rd January. 52nd single 'Help Me' went on sale, charting an Weekly 1st place. 6th April. Iikubo became a regular on YoungTown DBS. This weekly programme with Akishiya Sanma-san, Murakami Shouji-san, and Michishige Sayumi-san really taught her a lot of things. Tanaka Reina graduated at Morning Musume。's 2013 Spring concert at the Nippon Budokan on the 21st of May. And at the same time, Iikubo and Fuku-chan were inducted as the sub-leaders of Morning Musume。 With Tanaka-san's graduation, it was like a huge hole had opened up. They truly felt the amount of contribution Reina had provided to the group. Ayumi feels that Reina's graduation changed them as well. With Tanaka-san having taken up most of the main parts, Fuku-chan also feels that her absence had them working hard and improving their skills in order to grab a piece of the pie for themselves. So what are Fuku-chan and Iikubo's thoughts on becoming sub-leaders? It was hell for Mizuki - she'd never been a positive thinker, and she's the type who'll immediately gets discouraged when she can't pull something off. She'd get into negative moods, comparing herself to others, and being in low spirits. But the members and the fans helped pull her out of her malaise, which charged her up, and now she is how she is. For Iikubo, Fukumura-san's name being called was nothing out of her expectations, 'Ah, it's Fukumura-san'. Then her name got called out, and her mind panicked. It was the first time they'd had a double sub-leader. She feels that with Tanaka-san gone, the members united and supported one another. August 23rd, Morning Musume。 make their appearance on Music Station after 6 years. This was just when Sharan Q were starting activities again. Sayashi saw them on Music Station, and thought that it would be nice to be there. Immediately after having that thought, she received a message from their manager, telling them that they'd be making an appearance. Riho jumped in joy: 'No waaaaay! ', and called out to her parents to share the good news. Fuku-chan was really nervous, as part of the reason she'd gotten into Morning Musume。 was because of their music programme appearances. Even just getting up the stairs was a scary experience, so they rushed up the stairs frantically, not even thinking about pandering tto the cameras. After it had ended, everyone cried backstage, grateful for receiving the opportunity to sing a medley of two songs. On their way back, they received tissues, tissues given only to those who had made a Music Station appearance. While the others had left their untouched for the most part, Sayashi has started using hers, in the hopes that she'll be able to receive them again if they're able to make another Music Station appearance. And as we enter into 2014, Morning Musume。 was rechristened to Morning Musume。´14! The people in charge didn't make much of a fuss when they told the girls about the name change. The change was odd at first, but they got used to it. Thinking about it now, it was easier to remember with the appended number. There was some resistance at first, but they tried to take it positively. Once they gave it a go, they actually preferred it that way. Of course, that makes Mizuki afraid of becoming '15, since they had so many memories as '14 that she doesn't want to let go. In fact, Riho points out that it started getting fun when people started referring to them as 'One Four' rather than sticking to the Morning Musume。label. January 22nd. They made their appearance in au's commercials with Morisanchuu, the first commercial for these girls. While it felt incessant, even the people they appeared on music programmes with would sing along with the 'Zero, zero, zero'. Mizuki feels that it brought them from being known as the Love Machine Morning Musume。to the Morning Musume。 of today. January 29th. Release of 55th single 'Egao no Kimi ha Taiyou sa/Kimi no Kawari ha Iyashinai/What is LOVE? ', their first triple-A single, as well as their fourth 1st week Oricon in a row. Kimi no Kawari ha Iyashinai was tied in with Morning Musume。's role as the support ambassadors for the Sochi Olympics. They remember performing in front of the athletes, with the athletes waving around glowsticks as they performed. And in April, Sayashi enters senior high. Finally. She feels like she had been trying to catch up, and senior high was a complete change. Well, she's still irresponsible though, despite having become a high schooler. She had felt a bit held back in middle school, but she feels more in control, getting to pick the senior high she wanted to go to and doing the activities she wanted to do. April 29th. At the Yamaguchi performance of Morning Musume。´14's spring concert, Michishige Sayumi announces her graduation. The members themselves heard about it the day before that performance. Mizuki was really impressed with Michishige's strong determination to announce it at her hometown performance. So while it took some time to accept it, everyone understood, and did their best. September 30th. The 12ki members were revealed at the Nippon Budokan. Harunan pities the 12ki members, as they had such a limited time to work together with Michishige-san, compared to the time that the rest had spent together with her. So the onus is on them to give the 12ki just as much love. October 5th. New York concert. They all had English classes in preparation for the trip. Riho feels like she learnt something, as she could start figuring out words. October 15th. 57th single 'Tiki Bun/Shabadabadoo/Mikaeri Bijin' went on sale. This would be their last single with Michishige Sayumi. And on November 26th, Michishige-san would be graduating at the Yokohama Arena performance of Morning Musume。´14's autumn concert tour. [2ch] Where are the Momochi Musubi now?